Remember those kid’s riders where you put a quarter in a slot and the machine just starts to operate itself by slowly rocking and the child just feels very happy on it and they feel like they’d want to go faster? Well, why compromise the comforts of your own home to just let your kid enjoy that? This toy is a very classic symbol and trademark of childhood, as it is seen in our culture, either it is Eastern or Western, rocking horses has always been part of children’s play. To preserve that tradition, as well as adding a bit of modern touch, these activity rockers will definitely add that traditional feel to your kid’s childhood. The largest variety of children’s rocking horses and activity rockers are by Rockin’ Rider and Happy Tails. They not only provide the traditional ‘rocking horses’ but can provide an unlimited variety in any animal your daughter or son requires (or requests!). The choice is endless, making decision making with your children both fun (for children) and tedious/tiring (for parents!). Don’t forget, if you want a boy activity rocker that is not an fluffy or plush animal, refer to the motorcycle rocker below. Now, want the most popular rocking horse around? Well the radio flyer rocking horse (available here) is it. 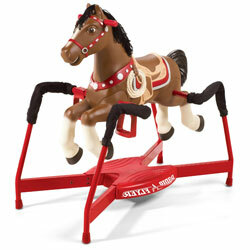 This rocking horse provides the most realistic horse experience for young kids. If your budget (and space) allows, this is the ultimate rocking horse, premium quality and premium fun. Why? It is the most advanced rocking horse and a kids rocking horse like no other. Here are some of the best features of the radio flyer spring rocking horse, but see below to view all! Not the traditional child’s rocking horse but surely it’s the most modern! Currently discounted, you can snap it up for less (see below for details). Bring forth the horsemanship on your child with this realistically made rocking pony, the Lucky Talking Plush Spring Horse (available here). Built very similarly to our #1 option, it’s made by another brand and can be bought a little cheaper than above. Unlike other commonly designed rocking ponies, this one can be shifted into different positions as your child grows taller and bigger. And not only that feature, it also has a talking, singing and moving mouth that kids of all ages would surely enjoy playing with. It’s available in both red and pink so suitable for both boys and girls. 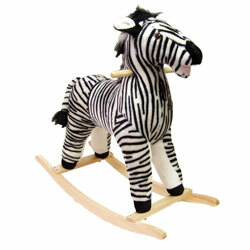 This plush rocking horse (available here) by Melissa & Doug is just simply, adorable. As a parent, I mainly liked it because of the color and texture of the horse is very soft, but more importantly it’s sturdy and offers a great deal of support. The horse is so soft you can hug it, hence why it’s called a plush rocking horse; a burst of fluffiness will break loose and for a child, it’s kinda hard to let go. 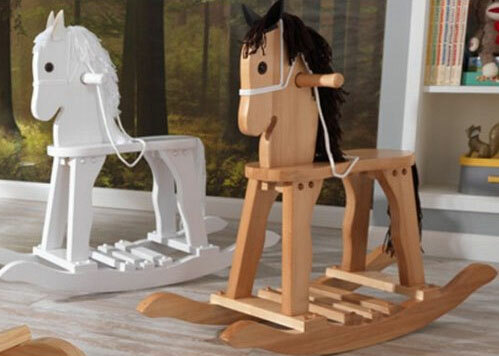 It’s made of highest quality materials (premium quality), safe as a baby rocking horse and also a rocking horse for toddler and is excellent value at under $100 (for latest price, see below). It is a great product for your child to play with! I actually had something like this when I was younger and well, it didn’t break, only after 13 years did it show a sign of aging. Hence why this little tikes rocker (available here) is so popular, it lasts the test of time and is super super affordable. This rocking horse is indeed a classic. I can’t recall how many times I’ve seen one of these being rocked by little children and having absolute fun; classic, simple and fun.. The best thing about this rocking horse is that no matter how hard you rock it, it doesn’t easily tip over. 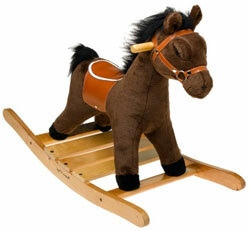 And if you do have a small living area, this plastic rocking horse would be the best thing for your child! Best of all, it doesn’t cost that much! 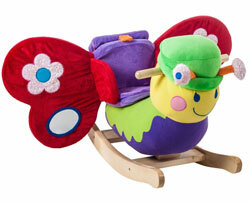 It’s a perfect baby rocking horse, suitable for ages 12 – 36 months. 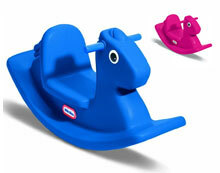 It’s availabe in two colors, the little tikes rocking horse magenta and little tikes rocking horse blue and being made of plastic, it’s perfect for outdoors on any surface, rain, hail or shine. 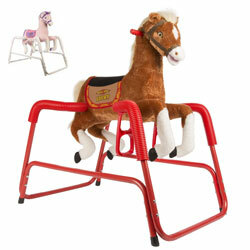 This KidKraft Derby Rocking Horse (available here) promises two things: tradition and simplicity. Amongst each and every wooden rocking horse you will find the simplest are the best. Made of quality, fine hard wood, it’s a traditional rocking horse with wool for its hair and tail and equipped with special extra safety features. What’s not to love about the rocking horse from Kidkraft? Another thing to keep in mind, it’s not something a child will grow out of, you can keep it for generations and pass it down. Alternatively it can be a feature in your growing daughters bedroom. When buying a wooden rocking horse you are sure it will not break or wear off right away as you are buying a quality product. Available in both natural and white, it’s quite large rocking horse which measures, 35″ x 11″ x 27.75″ (seat height of 15.5″). See below for further product details/specifications. These 2 in 1 Rocking Pony (available here) are a cute plush rocking pony for kids. For girls – I think this rocking pony is very feminine because of the primary use of colors pink and purple, which is pretty much seen in girls’ toys. But, other than the toy’s distinguishable colors, whether you pick the unisex rocking (this one) or the pink one (this one), this rockin rider pony also happens to be a roller as well! You get two for the price of one. On top of that, it talks and sings and the mouth of the toy moves. It’s like bringing My Little Pony to life…though it not really My Little Pony. But close enough. Oh, yeah! Go Grease Lightning! Bring out the cool, big boy smile on your little boy with this totally rocking, motorcycle rocking horse (available here, and now available for girls too, see below!). 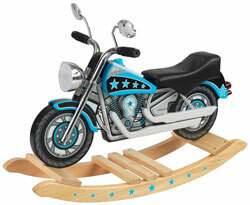 Updated: This motorcycle style rocking ‘horse’ comes in 2 additional styles. A pink motorcycle (available here) for little girls and also a ‘police’ themed motorcycle (available here). Both are exceptionally cute. The details look incredibly amazing, it’s as if you really are looking at a miniature motorcycle but with a catch – it is made from wood and it rocks! This is a common pick by boy children because it simply looks that hip and is different to the traditional wooden rocking horses. If you do have a little boy who likes motorcycles, you surely should give him one of these! I’m sure he’s bound to love it and play with it all the time, more so than a horse that is more so loved by little girls. OK, just a word of warning, as a parent, you can literally go crazy and want to order a few of these toddler rocking horse for your children. There is SOOO many to choose from, so from my experience, just pick the first one that comes to mind, otherwise, you’ll sit for hours deciding which one and generally you will probably come back your first pick. Apart from the normal plush rocking horses, here are some different ones you can consider also. Don’t remember, there is many to choose from, not just the ones below. Got tired of the usual rocking horses? Well, why not choose a different animal, a rocking dragon. Not that huge, scary dragon from the Hobbit named Smaug but a really cute dragon that kinda looks like those dragons in the Dragon Tales. This is a largely popular choice as something fun and different for kids. 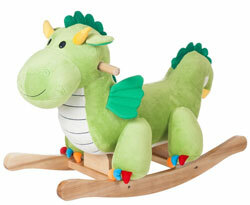 With the modern touch of a plush toy and the classic flare of pinewood rocker, springs forward this incredible rocking dragon that your children will surely enjoy playing with. How about a rocker with a little Eastern/Asian touch? Here we have the majestic, cuddly and gentle panda as your child’s ride to his or her wild imaginations. Maybe you can name it Bo (Po) from the Kung Fu Panda? Or maybe role play as the Dragon Warrior? Or maybe just pretend wandering through a Chinese forest filled with bamboos. 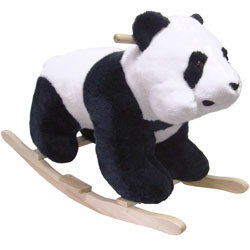 You surely can awaken a truckload of playful storylines with this rocking horse toy – in the form of a panda! A combination of plush, wood and an Asian trademark, your child will certainly enjoy playing this rocking panda all day long! We’ve had enough of mammals as an alternative to horses so, what about insects? For all the butterfly lovers out there (guilty, as charged), especially for the young girls, this would be a very good rocker choice. And well, young boys if they love insects. I adore its vibrant color and it’s plush-i-ness. But don’t let the plush-i-ness fool you when it comes to sturdiness. It’s a high quality wood rocker certainly does it’s job of being good ol’ reliable! Still from the Equus species, although not anymore a horse, but something really close. A zebra! They really are rather wild. I never really had the chance to see one in the flesh but hey, maybe someday. Anyway, I personally bought this animal rocker for my nephew and I enjoyed this animal rocker because it is a very cuddly plush toy yet the same time, it has sturdy legs. And you know what? This child’s rocker can hold as much as 80 pounds! That’s spells durability right there! Still can’t decide? 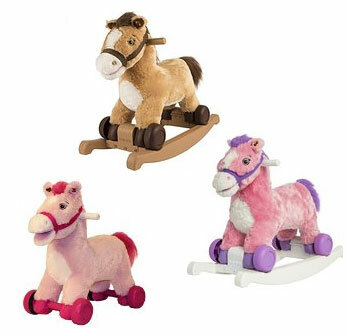 Click the buttons below to see the full range of rocking horses and rocking animals for children. Everyone is going crazy for the radio flyer rocking horse at the moment. GoKidsPlay.com is a website in which the idea seeded in 2012 but didn't come into action until 2014 by two families, the Aker family and the Hedley family. GoKidsPlay is a site made by parents for parents. As parents, we understand how it feels to be a parent and to guide your kids in the right direction whilst trying to manage your life and responsibilities. Although it has grown into a community of many parents and families, it was originally founded by two families who were juggling the balancing act - bringing up active toddlers, meeting work commitments and trying to enjoy life, but also wanted to help themselves and other parents in order to make life 'just that tad bit easier' for all parents. Contact us for more information of if you want to contribute to building our community, please don't hesitate!